Schools, teams, and clubs often like to provide gifts to their graduating students. They want to give something that not only serves as a memento, but also will be used and enjoyed. Blankets make a great gifts because everyone loves blankets and they can be used everyday. For students going to college, blankets are great to have in the dorm room or taking to the park or to the game. Also, you don't have to worry about sizes, like you do with t-shirts or sweatshirts, so they are easy to order and give out. And with your embroidered or screen printed logo, they make cherished keepsakes. You can even add individual names and numbers for a personal touch. 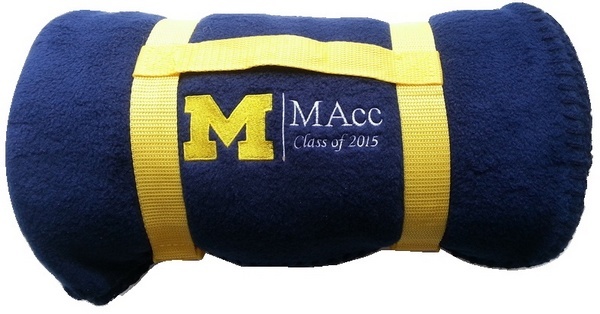 The most common blankets chosen for graduation gifts are our sweatshirt blankets. They're warm and cozy, constructed with the same fabric as your favorite sweatshirt. They come in standard 50" x 60" size or jumbo 54" x 84". Other favorites are fleece blankets, waterproof blankets, and even sherpa blankets for some groups that wanted something a little more luxurious. Here is a collection of our most popular school blankets. You just can't go wrong with blankets for a graduation gift students will love. What graduation gifts have you gotten that you loved?